New House Farm used to be at the end of Church Road, where New Ash Green is today (see map of farm superimposed onto the 1936 Ordnance Survey Map below). 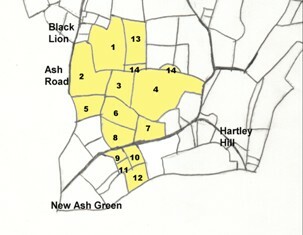 It is the source of the "New" in the name "New Ash Green". Not all of its fields have been built over, 65 acres remain in Northfield and the farm has also been commemorated recently in the name given to the ancient woodland there of "New House Shaw". Once one of Hartley's larger farms, most of the fields that made up this farm and the site of the house in Church Road, now lie under the houses of New Ash Green. 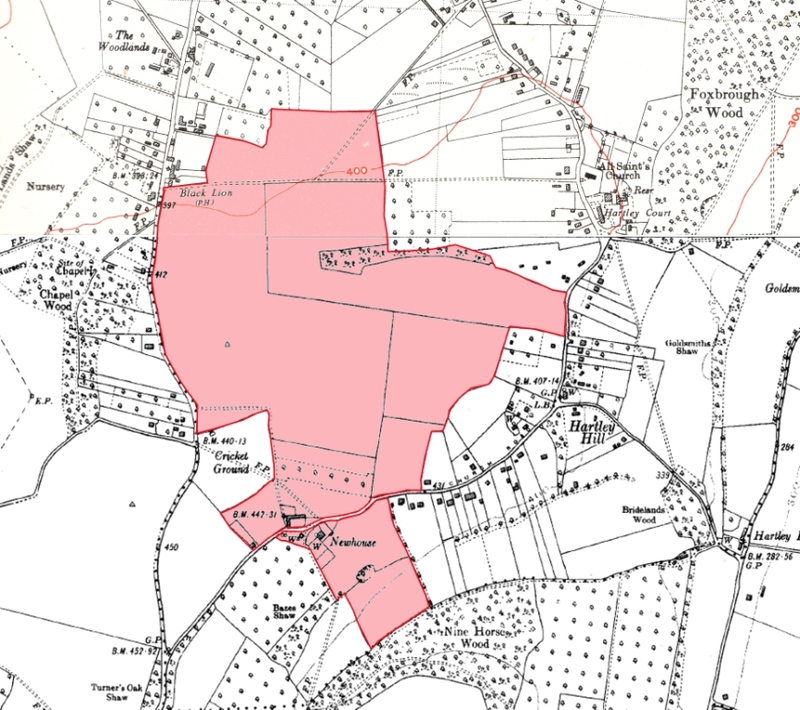 In addition Quakers Close, Hottsfield and Copse Side were all part of Hottsfield, which had belonged to the farm since Thomas Burrows of Longfield (d 1656) purchased it from John and Jane Howell in 1617. New House Farm in its modern form is an amalgam of two holdings purchased by the Burrowes family. Thomas Burrow bought a farm and 35 acres from John Northash in 1583, and in 1622 the family acquired another 72 acres (roughly equivalent to Northfield) from Richard Overy. The Overy's had purchased their holding from Thomas Tappars in 1555. In 1656 the farm was rented out to one Thomas Letchford. The plan below shows the fields of the farm at the time of the tithe survey in 1844. It is likely that part of the farm near Church Road was part of a 45 acre farm owned by the Blodiner family in the c13th, some 14 acres of which was inherited by John Eylnoth in about 1288. The Northahses were an old Hartley family, although their surname betrays their origins. A John Northash is Hartley's oldest known churchwarden (1433), and anther John Northash left his land in the parish to his son Richard in 1506. The earliest mention of the Overys at Hartley is the John Overy who took minor holy orders in 1366. However by the c16th they were Hartley's biggest landowners - Fairby, Woodins, Mintmakers, Forge Cottage and Hartley Cottage all belonged to them. 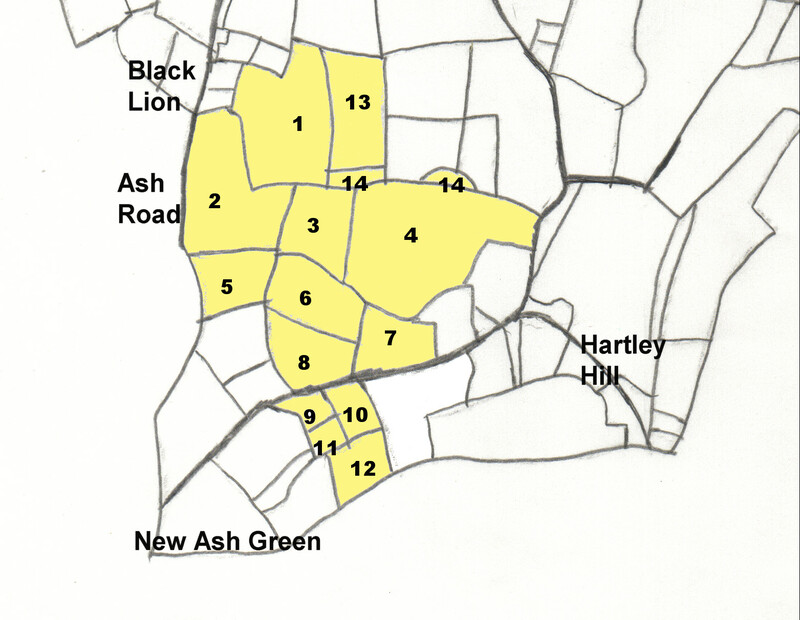 The Burrowes hailed from Longfield but had gradually expanded their landholdings in the 17th century to include land at Ash and Darenth. 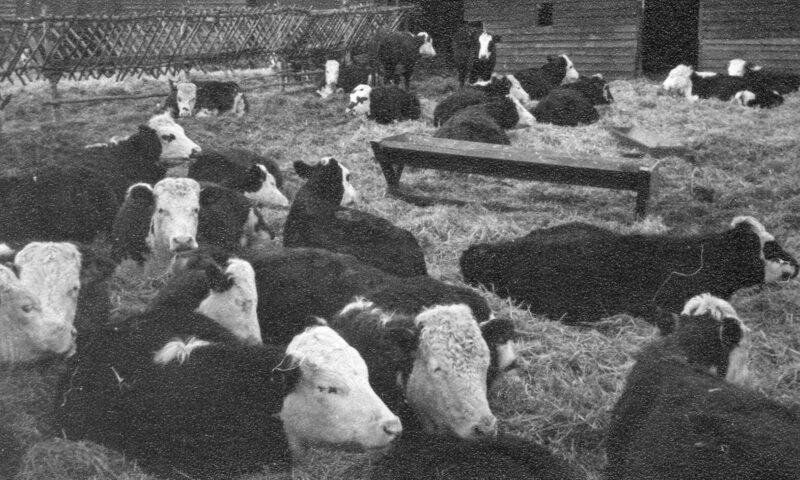 Sometime between 1663 and 1671 the family moved to New House Farm, which may have been rebuilt at the time. A good description of the farm can be gleaned from the probate inventory of James Burrowes (d 1695, he had married Margaret Young, daughter of the owner of Fairby). It mentions 7 rooms in the house as well as a brew house and barn (destroyed by fire in 1938). The farm was mainly arable with wheat as the main crop. James also possessed 6 cattle, 1 horse, 5 sheep and 4 pigs - a low figure which suggests he probably had given most to his family already. He was succeeded by his son James (d 1729), who is commemorated by the large memorial in the nave of Hartley Church. In the 18th century New House Farm descended to William Selby, who had married Elizabeth Burrowes. She outlived her husband and left the estate in 1790 to Sarah Iffield, who had married John Tasker. The Taskers were well known Dartford brewers, and perhaps it is not too fanciful to assume that some of the hops from the farm would have found their way into Tasker's "Triple X" ale. 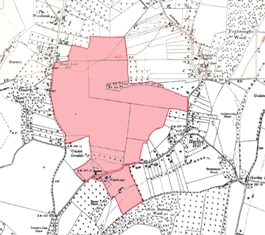 They were not totally unconnected with the area, for the Taskers had bought land in Ash and Longfield 60 years previously and John's grandfather was married at Hartley Church in 1726. John's son, John, who inherited the estate was a director of the Dartford Gas Company and a noted benefactor. The brewery owned many pubs including the Chequers at Crockenhill, but the Hartley pubs were in the hands of their rivals. When Sarah Tasker died in 1845, she still owned New House Farm which she left to her daughters Sarah and Mary. They were succeeded by Thomas Bradley, the Forrests and Miss E M Forbes and George Day (of North Ash Farm). New House Farm, and the rest of the North Ash Estate was put up for auction in 1926 by Mr Day. 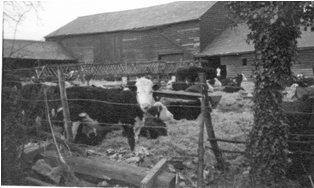 As well as a "superior farm house" the estate boasted stables, bullock shed, barn, wagon sheds, kiln oast and granary and the pair of cottages called "New Hayes Cottages". The particulars stated "special attention is drawn to the rapid building developments adjoining this lot, and to the fact that field No. 112 (Northfield, Farm Holt, Caling Croft etc) is now practically the only building site left, and with its frontage of 1,500 feet this portion could readily be sold off without detriment to the farm." In 1941 New House belonged to Messrs Ansell and Hunt of Romford. The Burrowes were the last owner occupiers of the farm, which for over 200 years was farmed by a succession of tenants, listed below. William Treadwell junior was married to Eliza. In 1868-9 he marketed a "hop wash" which he claimed would sort out aphis blight and encourage growth. His advert in the Kentish Gazette of 3 August 1869 contained a testimonial from Mr Edmeades of The Hazels, Southfleet. Both William and Eliza were very long lived. William died in 1910 aged 81, while Eliza (b 1831) lived to the age of 90. 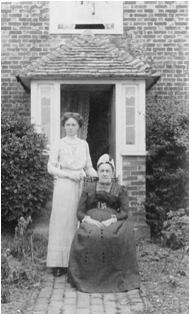 The picture below is believed to show Eliza and her unmarried daughter Catherine, who was born at New House Farm and worked as a governess. 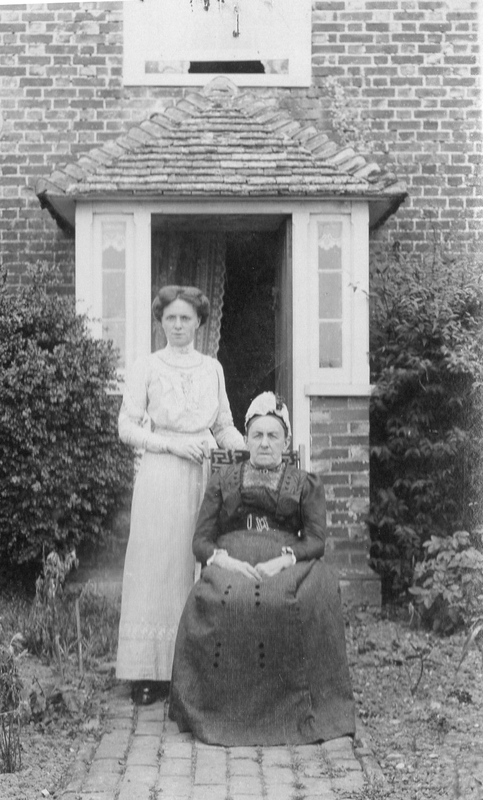 It is probably taken at Malt House Farm, Green Street Green where they were living in about 1910. Thomas and Austen Gambrill started a farm business in 1869. Austen farmed land at Crundale near Canterbury, while Thomas took charge of New House Farm. The lease from Messrs Forrest in 1869 was for the farm and 207 acres at an annual rent of £240. They brought no money to the business, rather relying on loans from family and others. They were not successful farmers, and didn't keep proper accounts (or had destroyed them as the Registrar said he believed had happened). Thomas only kept a ledger of goods sold, not of farm expenses. 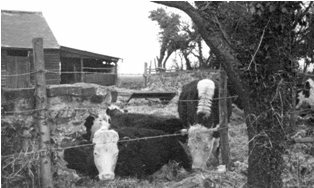 Both farms lost money every year and inevitably the business failed in 1885 with enormous debts of £21,000 (about £1.7 million today). Thomas blamed a number of "bad seasons and bad prices". The court Registrar said "he was sure this part of the county of Kent had never had a more reckless case than this." In the end the poor creditors got just 5p in the pound. A wonderfully detailed auction catalogue of 1885 with the names of the buyers and price paid exists in the Centre for Kentish Studies. When the War Agriculture Executive visited in 1941, they were impressed with the farmer, Marwood Fulford, giving him an "A" grade. 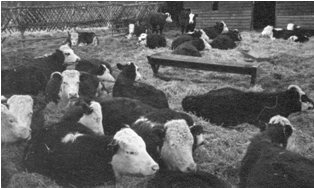 Like the farm of two centuries earlier it was mainly arable, growing a variety of grains and fodder crops as well as keeping a few pigs and cows. To help the war effort, some grass fields were ploughed up including the site of the future Farm Holt. There is evidence that the farmland was good quality, for before the war more demanding crops such as cabbages and strawberries were grown on the land later called Northfield. The photos below were taken in the last years of the farm by local resident, Winifred Iddison. 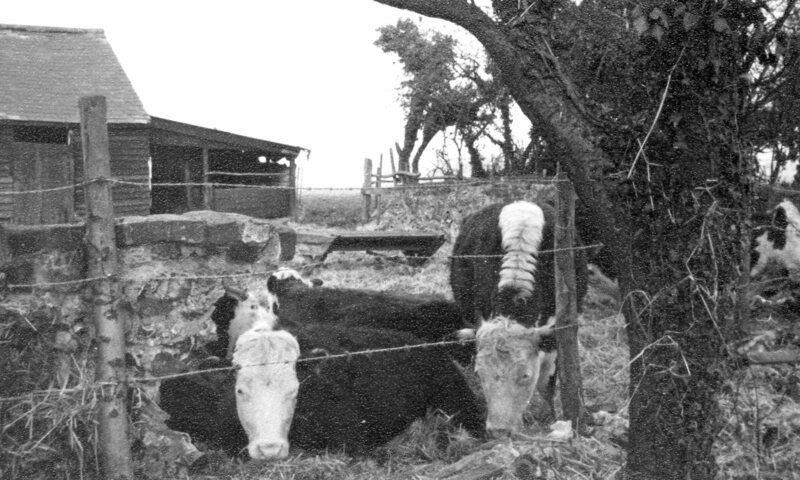 The owners Ansell and Hunt applied for planning permission to build on New House and North Ash Farms in 1960, but this was refused by Dartford Rural District Council. Mr and Mrs Fulford continued to live here until 1963; on account of their age, they decided not to take up an offer to buy. Instead the land was bought by Span Developments who renewed the planning application in 1963. This too was refused by the council and planning inspector, but this was overturned on appeal by the then Secretary of State for the Environment, Richard Crossman. 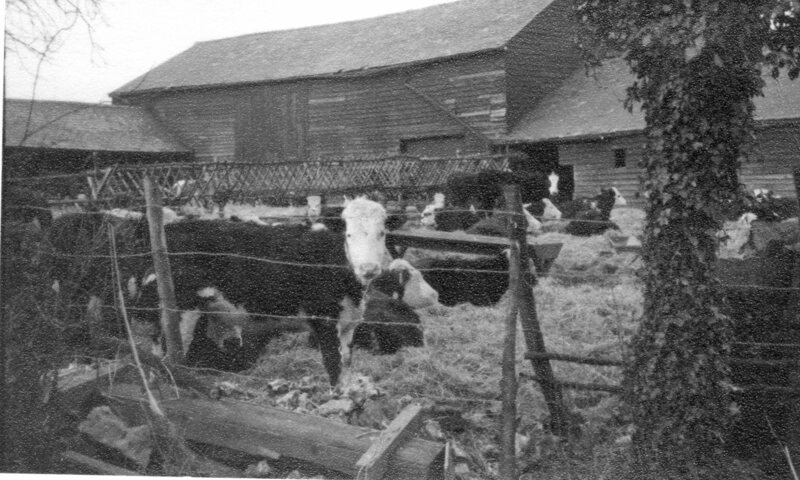 The farm house and other buildings were demolished, but part of the land was still farmed until 2001. In this case Walter Blodiner had died. He was the owner of a 45 acre farm at the top end of Church Road in Hartley, which his family had owned since at least 1232. His nephew and heir John Eylnoth found a number of people in possession of 31 acres of the farm in 6 holdings. He sued for possession, but they in turn claimed Walter Blodiner had sold (enfeoffed) the land to them. The fact that henceforth this end of Church Road had a number of smallholdings, shows that the defendants must have prevailed. Some of the holdings mentioned can be identified. The assize came to acknowledge whether Walter Blodiner, uncle of John Eylnoth was seised in his demesne as of fee of 44 acres and 1 rood of land and 3 roods of wood, with the appurtenances in Hertleye on the day on which etc (he died). And whether etc., whereof John le Clerk of Horton holds 6 acres of land and 1 rood of wood therefrom; and Simon atte Wode holds 5 acres therefrom; and Alice, who was the wife of Robert Fauer holds 2½ acres of land therefrom; and John, son of Henry atte Silwro (?) and Simon his brother hold 3 acres therefrom; and Alarus Veysyn holds 1 acre of land and 1 rood of wood therefrom; and Alice daughter of Osbert holds 13 acres of land and 1 rood of wood therefrom. And all except the said Alice, daughter of Osbert, (said) that the said Walter, concerning the death of whom etc, had not died seised in his demesne as of fee; for they say that the said Walter had enfeoffed them thereof a long time before his death. And place themselves on the assize regarding this. And the said Alice, daughter of Osbert did not come and she is to be summoned etc, and judgement is respited that she should be at Rochester on Friday nest before the feast of St Margaret Virgin etc. Near Farningham and Dartford, Kent, about 1½ Miles from Fawkham Station on the London, Chatham and Dover Railway. May be viewed on the morning of Sale d Catalogues had five days previously, of Mr. Crowhurst, on the Premises, and of Mr. WILLIAM. HODSOLL, Auctioneer, Valuer, &c., Farningham, Kent. I.—The highest bidder to be the buyer; and should any dispute arise between two or more bidders, the lot in dispute to be put up again and resold. 2.—No person to advance less than one shilling ; above one pound, two shillings ; and so on in proportion. 3.—The purchasers to give in their names and places of abode and to deposit five shillings in the pound, in part payment of the purchase money, at the fall of the hammer, if required. 4.—Each lot to be taken away, with all faults or errors of description, at the buyer's expense and risk, between the hours of nine a.m. and three p.m on the day after sale, and payment to be made before delivery. No lots will be delivered during sale. 6.—If any purchaser fail to comply with these con¬ditions, or if any lots remain uncleared after the time specified, the deposit money to be forfeited, the lots resold either by public or private sale, awl the deficiency (if any) by such second sale, together with all charges attending the same, to be made good by the fiat purchaser, and shall be recoverable as and for liquidated damages. Lastly.—The Auctioneer to be sole arbitrator in every matter of dispute, whose determination shall be final, conclusive and binding on all parties.